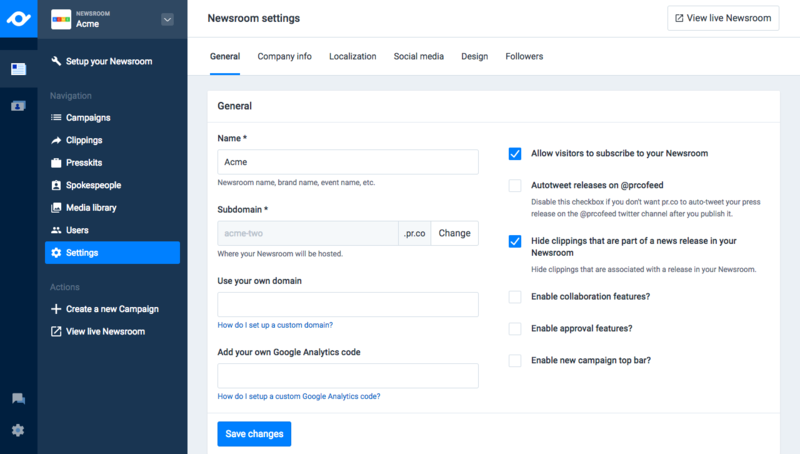 Step-by-step guide to setting up your pr.co newsroom. Online PR doesn't need to be overwhelming. This is a guide to getting you up and going with pr.co as quickly as possible. 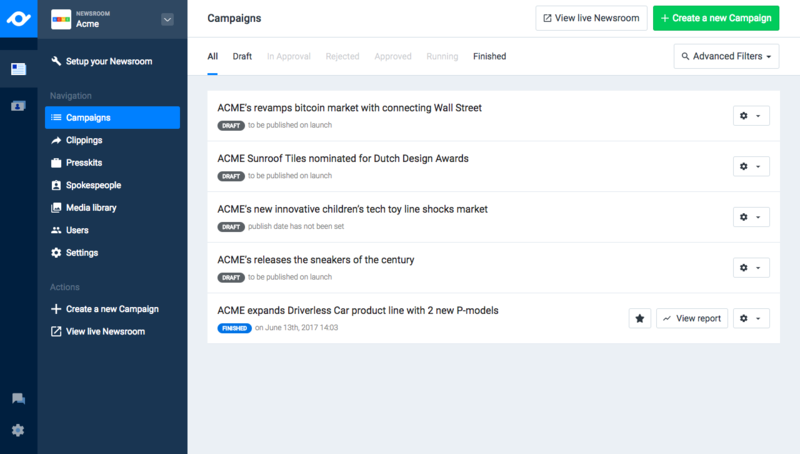 If you're looking for media coverage for your startup, or for a smarter workflow for your PR agency, you're in the right place! Here starts your journey. 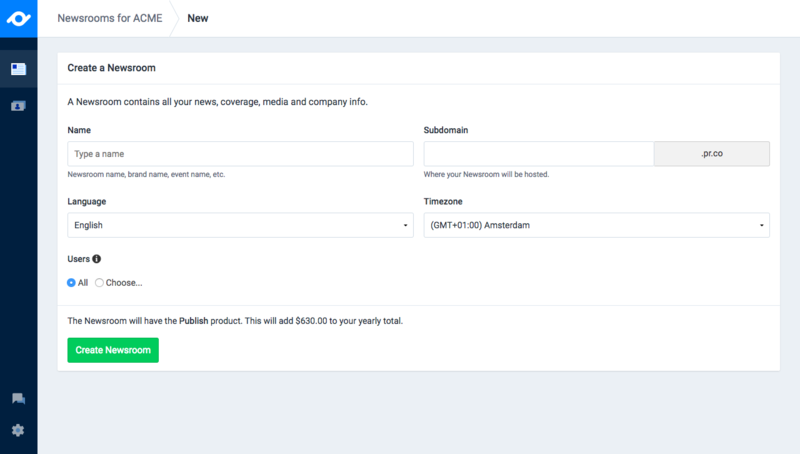 In this guide you will learn how to set up your newsroom, create presskits and publish your first campaign. Or, you can just start writing your first campaign right away. If you have any additional questions, you can go through our tour pages, check the prices or get in touch by email - we'd love to hear from you. 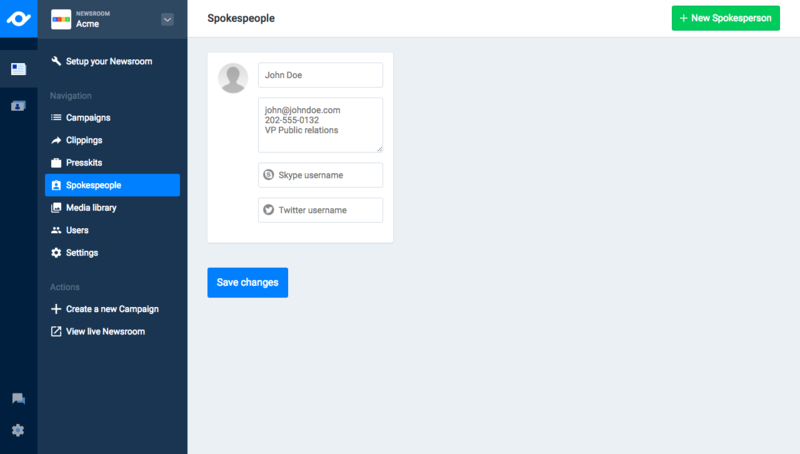 Right after you login you can create your newsroom. 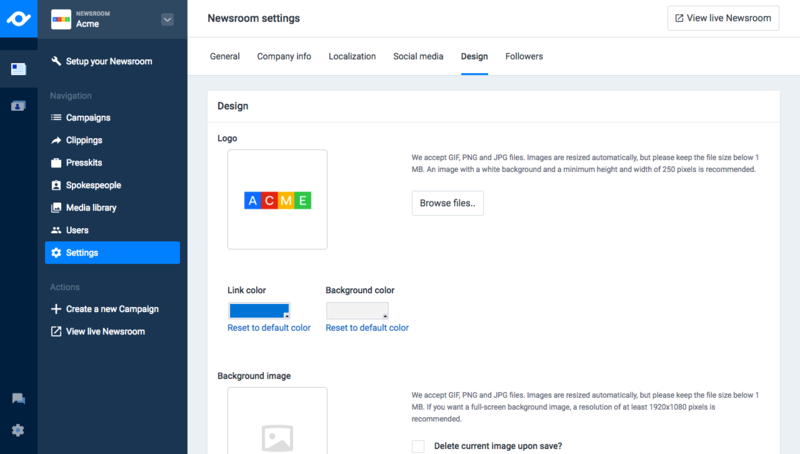 The name of the newsroom is the first thing users will see on the top left of the page, together with your logo. The name is usually your company's name, or the product you're launching. After that, set up the subdomain: this is the url where your newsroom will be hosted. You can also customise it. We also need to know what is the language of your newsroom and the timezone. What company is behind this newsroom? The information you provide here will create a boilerplate at the bottom of every news release of this newsroom. Here you can recap what the company does and some contact information, such as address, phone number, etc. The online presence is also important: add your website, LinkedIn page, Twitter handle and any social profile that adds value to your newsroom. Make sure your readers can find who to contact when they have further questions about your newsroom. Spokespeople's pics come directly from their Twitter profiles, but you can still change them by clicking on the icon. On each campaign you can rearrange the order of your spokespeople. There are many ways to customise the design of your newsroom in order to match your online brand. You can upload your logo on a white background, customise the color of the links, upload a background image and even add custom CSS. 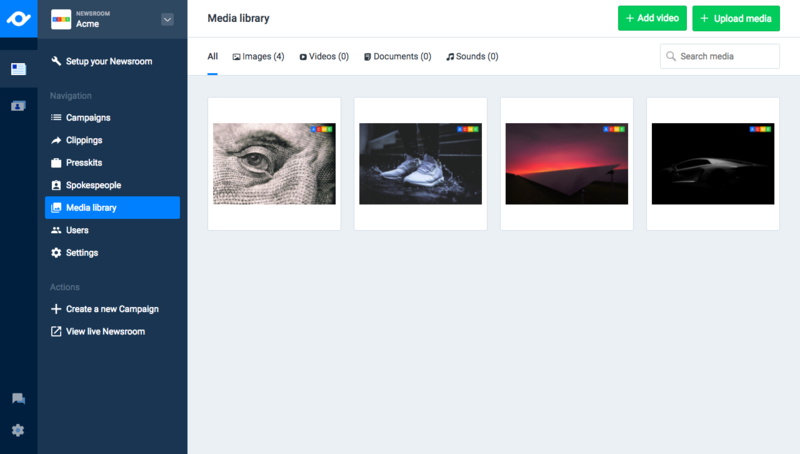 The Media Library is the central hub for your files: pictures, videos, documents and audio files. 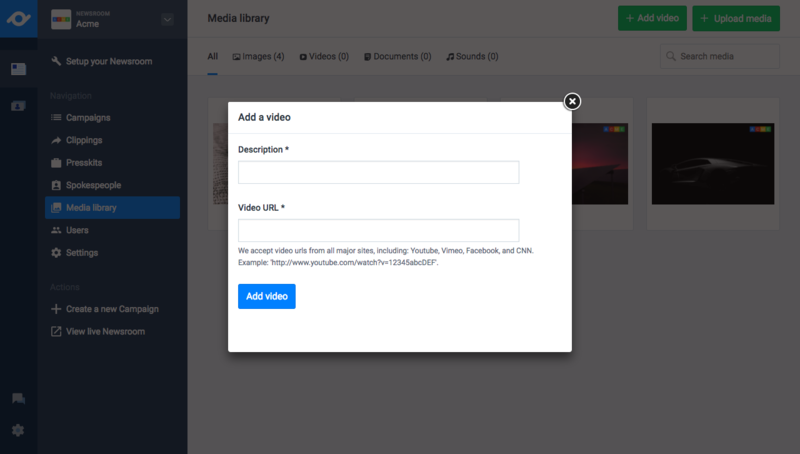 Once your files are in the Media library, you can add them to your campaigns and to your presskits with one click. You can also add videos from an external source - the most common ones are Youtube and Vimeo. Make sure you set the video as public from the original platform - if you change the visibility right before you add it to pr.co, it may take up to 24 hours for the video to be available. 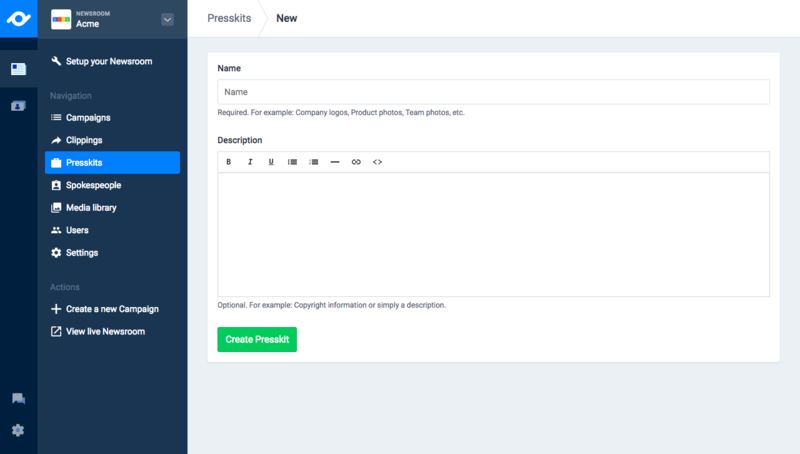 The presskit is the place where you show rich media related to your brand. Think of logos, product videos, promotional material, pictures of the team. Whatever makes it easy for a journalist to enrich a story. You can group your materials into different presskits. 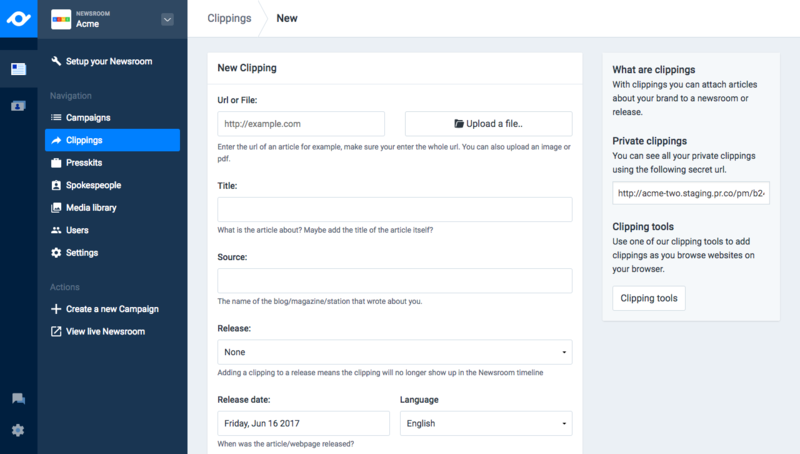 With clippings you can easily collect and save all the media coverage you earned. You can add clippings directly from your newsroom or use our browser extension to collect links and screenshots from your moments of fame. Clippings can be linked to a specific campaign and be filtered by language. Chances are you're not the only one working on a new campaign. Sending drafts back and forth via email is not very convenient: just invite other users to the newsroom and work together. The number of users you can invite to join your newsroom depends on your subscription. You can also decide what kind of access you give them. Now it's time to write your first campaign! We take care of all the technical details so you can focus on storytelling. You can share a private link of your draft with clients and coworkers to receive feedback before publishing.